Browse through our many Salt Lake City landscaping services and learn how they can benefit your landscaping needs. Are you tired of dragging a hose around the yard, in the heat, and forgetting that the hose is on? Using too much water during the summer months? Do you have sprinklers that don’t cover evenly, leaving dry spots during the hot months? Do you want to conserve water and be conscious about our water conservation? Does your water bill seem too high during the summer? Want to know how to conserve water and be more efficient with your water use? Water leaking out of heads? New home and don’t know where to start? Call us for a consultation about Salt Lake City sprinkler installation and price. 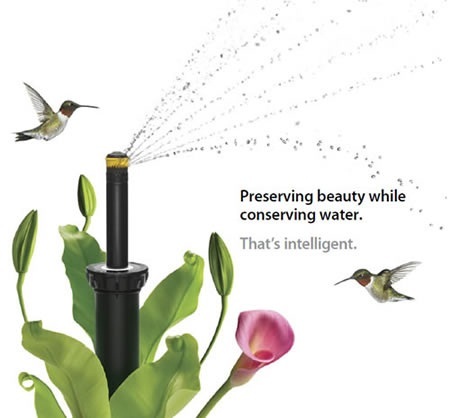 We install water efficient systems that will run during optimum watering times, also dividing them into individual zones to separate areas that need different amounts of water such as lawn and planter areas. We do all the work taking your water pressure and mainline size, running the amount of gallons per minute that your home will allow for your system to run at the proper pressure. Does your Salt Lake City home need expert and affordable snow removal service? Ridgeline Landscaping specializes in snow removal all along the Wasatch Front, for commercial properties and also residential snow removal in Utah. 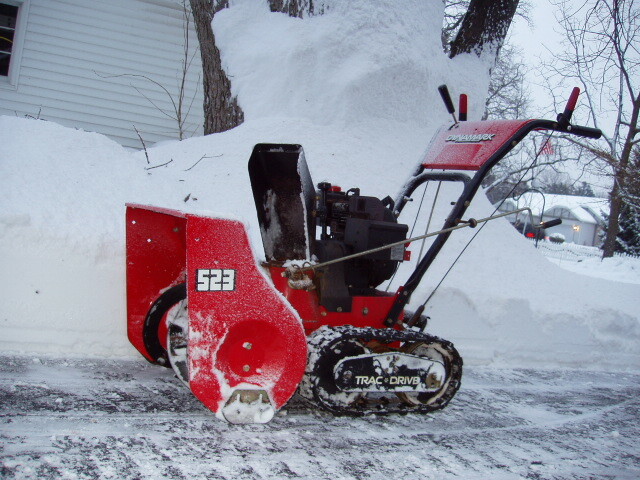 Ridgeline Landscaping is your best resource for experienced and affordable snow removal. If it is snow plowing your walkways and driveways, or clearing the snow off of the streets in your neighborhoods that you need, Ridgeline Landscaping does the most complete work out there. We always have the snow cleared before there is any need for you to deal with it! It’s easy to schedule snow removal service with us. Mornings, afternoons and evenings. Call Ridgeline Landscaping for all of your needs today! Does your yard have drastic slopes that make it unusable? Would you like to have a level area for the kids, patio, planter, or just make elevations level? Rock adds natural beauty in any yard. A retaining wall, in Salt Lake City, installed out of natural rock boulders, or block, looks absolutely beautiful and improves the use of those sloped areas. Retaining walls also help with water conservation leveling areas so water does not run off into unwanted areas or neighboring yards. 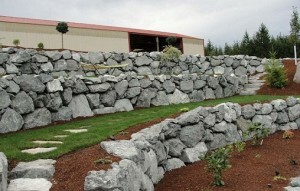 Retaining walls add beauty and value to any landscape. Do you have a yard or site that is not level or does not maintain proper drainage, or slope to promote water travel in desirable directions? Are you starting over and want to tear everything out in your yard? Do you need site clearing and hauling off of debris? Are you in need of topsoil, and installation to achieve proper grade? Don’t want to dig by hand? Do you need to dig out existing poor soil and rock to allow for topsoil? Does topsoil need to be added to our yard and beds? 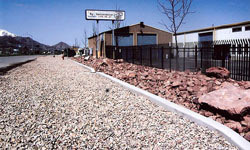 We perform grading, installation of topsoil, and excavation in Salt Lake City. Grading a project is very important. Directing water travel in proper directions to prevent flooding from taking place is grading properly. Also, excavation, grading and installation of topsoil promotes water conservation, plant growth, and in turn a beautiful landscape. 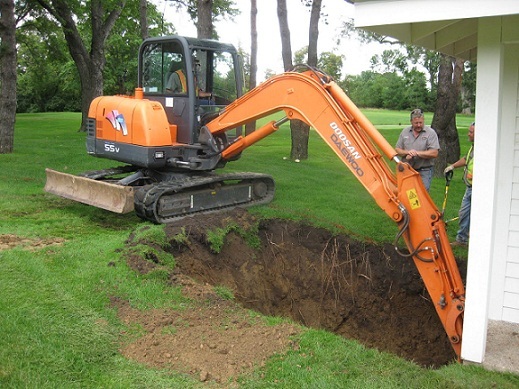 If you are starting over by excavating and removing, we can help. 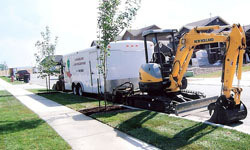 Grading & excavation in Salt Lake City & surrounding areas, is key to a successful landscape. Are you tired of mowing, weeding, dealing with sprinkler repairs, fertilizing, and the sun? Dealing with unreliable Salt Lake City landscape maintenance companies? Want to hire someone to take over those worries and headaches? Are you a business looking for a respectable contractor to hire to help promote your business by making the grounds look incredible? 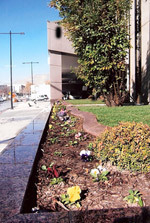 We are a full service Salt Lake City landscape maintenance company, which provides weekly services and monthly billing. We have the knowledge to maintain all your landscape maintenance (Salt Lake City area) needs from designing, and planting of annuals, to maintaining nursery stock, lawn care, and maintaining sprinklers. Contact us for monthly rates on all our services. Do you want to improve your landscaping, lower maintenance, define lawn areas from planter areas? Are you interested in a custom look to your edging? Do you want to match the look and style of your home with your curbing? Our curbing is custom allowing you to pick your color and design of stamped pattern providing you with the look and feel you want. Curbing can be installed in existing yards with minor sod removal. 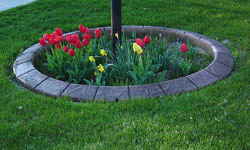 Curbing helps provide divisions between beds and lawns or other areas needing division with a custom look. Is your driveway cracked? Need a patio or just make it bigger? Walks added to and from places in your landscaping? Need tear out and demolition of your concrete? Don’t forget about the hot tub pad. While landscaping this is the time to think of your hardscape needs. 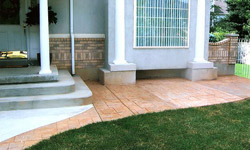 We install custom concrete helping you pick your color and stamping patterns, also advising you on size and placement. Concrete is very crucial and adds to landscaping and design. While landscaping this is a good time to think of concrete installation and or removal. Do you love the sound of running water? Have a corner in your yard and don’t know what to do with it? Can you bring the peace and tranquility of the mountains into your yard? Can’t afford therapy? Is life a little stressful? Want your water feature cleaned or repaired? Water features provide that sound we all love to hear. A feature uses up space that you don’t know what to do with. If you have kids, water features can be done pondless. 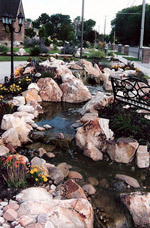 Pondless water features are lower maintenance use less water and attract fewer bugs. We clean and repair water features. A water feature is a less expensive than a therapist! Consider one in your landscaping. Do we do installation and design of nursery stock? Do we plant flower beds with flowers? Do we sell nursery stock? 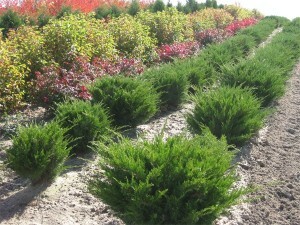 We install all nursery stock and have availability to most all sizes and varieties that will grow in Utah. Also flower bed design and planting of annuals. Are you tired of mowing the lawn, and weeding flower beds? Are you ready to save money every year? Is your business or home ready for a makeover? Xeriscaping is the way to go using a combination of rocks, barks, weed barriers, curbing or edging, and drip systems to accommodate the plants installed. Ask about suggestion on how you can improve your yard and landscaping today. Do you need sod? What kind of sod is best to install? Do I need topsoil to install sod on? Is there a time of year that is better for installation of sod? Can we install our own sod but have everything else installed and ready? Hydro seeding? We provide sod on landscaping projects. Sod that we use is a Utah blend that has been created and designed for Utah and our climate and conditions. This sod is a blend of different grass that grows well and is drought tolerant. Sod can be installed any time of the year, but spring and fall are optimal due to temperatures being cooler and water usage is going to be less. Automatic sprinklers are very critical to the success of new sod and growth. A good layer of quality topsoil provides a base that the sod roots can penetrate and also will retain water for the roots to absorb. 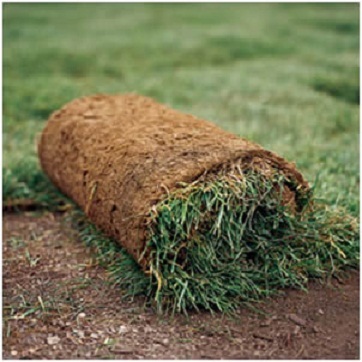 Some home owners choose to install their own sod and that can be arranged. Hydro seeding is about a fourth the cost of sod and takes more time and maintenance to achieve a beautiful lawn but does save money in the out of pocket expense. We deliver and haul off bulk materials: Topsoil, Gravel, Decorative Rock, and Patio Stone. To request a service call or estimate, please complete the form below.